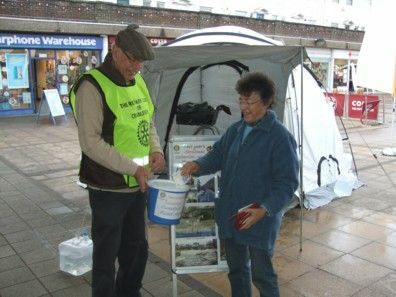 Cranleigh Rotarians were out in force 17 - 19 December for their annual street collection. This year the collection raised a fantastic £2,200, which will be sent to help those families and businesses hard hit by the recent floods in Cumbria. "The Rotary Club would like to thank everyone who gave so generously to help those in need in the disaster-struck Lake District," said Tom Cornwell, President of the Rotary Club of Cranleigh. "This was one of the most successful Christmas collections for good causes and charities that we have ever made." (Above). Rotarian David Gill receives a donation from Margie Nursey. (Right). 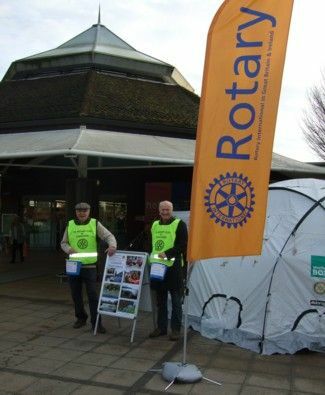 Rotarians David Gill and John Woodford collecting for the victims of the flood disaster in Cumbria. In the background is a Shelter Box tent like those sent to disaster areas all around the world.